Each year, US researchers spend 4000 person years creating and exhibiting posters at meetings (globally it could well be 10 times this number). Science (and engineering) posters are a window into the state of knowledge and research at hundreds of universities and research laboratories. These posters are designed to highlight the latest achievements… years before these are published. Often displayed for a few hours to several individuals, the posters are generally tossed away (as is their ephemeral fate). The equivalent of centuries of work dumped into landfills without a trace each year. In January 2011, the Federation had a better idea; In the hallway of the Winter 2011 ESIP Federation Meeting, a conversation was started on the value of a digital poster service for the ESIP meetings: the initial added value was access—access across the whole Federation, and access across time. The notion of an ESIP Digital Poster Service was born. Within a month, this conversation was expanded to include the Alfred P. Sloan Foundation. Within 3 months the pilot effort was funded to be tested at the 2011 Summer ESIP meeting. Beyond the scope of the Federation, the idea of an academy-wide digital poster commons captures the real value that science/engineering posters bring to the research endeavor. When combined with semantic and geographic services, posters become postcards that science teams send out to the entire academy… seeking for new ideas and potential new collaborations. Review the pilot test and record lessons learned for the next phase. Develop partnerships with other Earth Science meeting organizers (and then, other disciplines) to add more meetings. Acquire support for a more robust digital meeting poster service that can accommodate a wide range of meeting requirements. 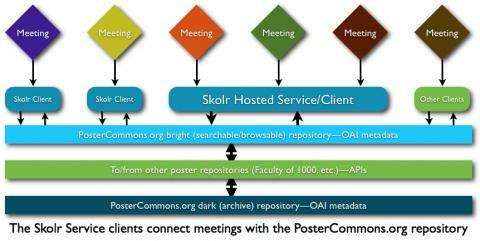 Build the poster commons metadata requirements and APIs to the open-source poster service. Enlist experts and stakeholders in the conversation about the merits, opportunities, and complexities of this service.